Make a nomination & see past award winners. Nomination forms for Friend of Science and for Outstanding Service Awards are below. The Iowa Science Teaching Section of the Academy presents awards in three categories annually. The Friend of Science awards originated in 1995 and include Corporate, Group or Individual, and Outstanding Service categories. The Outstanding Service Award was first presented as the Distinguished Service Award by the Iowa Science Education Association (ISEA) before it became the Iowa Science Teaching Section of the Academy. The first year of the award with the Academy was 1983. The name of the award was changed from Distinguished Service to Outstanding Service Award in 2009 to eliminate confusion between it and the Academy's Distinguished Service Award. Up to two individuals, groups, businesses, or corporations will be recognized at the Fall Conference for supporting science education in your building, school district, region, or the State of Iowa. Read the award descriptions below before filling out the appropriate form. ISTS recognizes with a plaque corporations, coalitions, foundations, or government entities that have made significant contributions to ISTS and/or to science education at the local, regional or statewide level. Awards are presented in the categories of small corporations and large corporations. ISTS recognizes with a plaque an individual or group within the state that has made significant contributions to ISTS and/or to science education at the local, regional or statewide level. For example an individual or group may have volunteered to work in your school, your district or a wider area to help science education. Past winners have donated equipment, time, expertise or funds to promote science learning and teaching. ISTS recognizes with a plaque an ISTS member who has made sustained extraordinary contributions to ISTS and/or to science education at the state and/or national level. Scroll down to view lists of past awards in each category. 2015 Corporate Friend of Science Award was presented to the Iowa Limestone Producers Association. 2015 Corporate Friend of Science Award was presented to Indian Creek Nature Center. Pictured from left to right: Craig Johnson, Iowa Academy of Science Executive Director, Jennifer Rupp, Indian Creek Nature Center Program Specialist and John Myers, Indian Creek Nature Center Executive Director. 2015 Group Friend of Science Award was presented to The World Food Prize Youth Programs. Pictured from left to right: Craig Johnson, Iowa Academy of Science Executive Director, Jacob Hunter, The World Food Prize Director of Iowa Educational Programs and Lisa Fleming, The World Food Prize Director of Global Educational Programs. 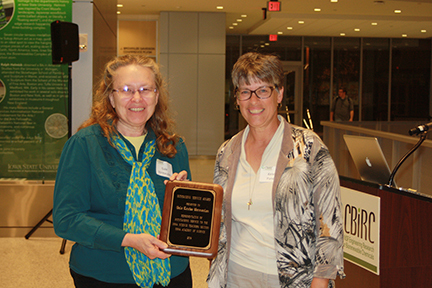 2015 Individual Friend of Science Award was presented to Doreen Hayek. 2015 Outstanding Service Award was presented to Yvette McCulley. 2015 Outstanding Service Award was presented to DeAnna Tibben. 2014 Corporate Friend of Science Award was presented by Kelen Panec, Chair of the Iowa Science Teaching Section. Accepting for KEMIN are Penny Woods (L) and Zita Quade. Ron De Armond, CEO, Pella Wildlife Company accepting Corporate Friend of Science Award from Kelen Panec. Peter Holden, North Tama Schools & Mayor of Traer receives Friend of Science Award presented by Kelen Panec. Gale Vermeulen (L) is presented an Outstanding Service Award by Kelen Panec.